Breeze helps you run your marketing projects simply and effectively. Why use Breeze as marketing project management tool? Breeze is built from real-world experience of managing hundreds of projects over the years. Fast-paced projects, constant feedback, and improvements are at the core of Breeze. It has all the tools for easy communication and feedback with your marketing team and clients. In the end, Breeze helps you set real goals and get things done. Create, track and manage your marketing plans. Gather and give feedback to clients. Share content ideas and gather feedback. Upload your ideas to the cloud. Manage ad and content campaigns on time and budget. Whether you are managing internal marketing projects or for clients, Breeze helps you create strategies, content and manage campaigns. Easily manage every step of your marketing plan. Create tasks and assign them to people. 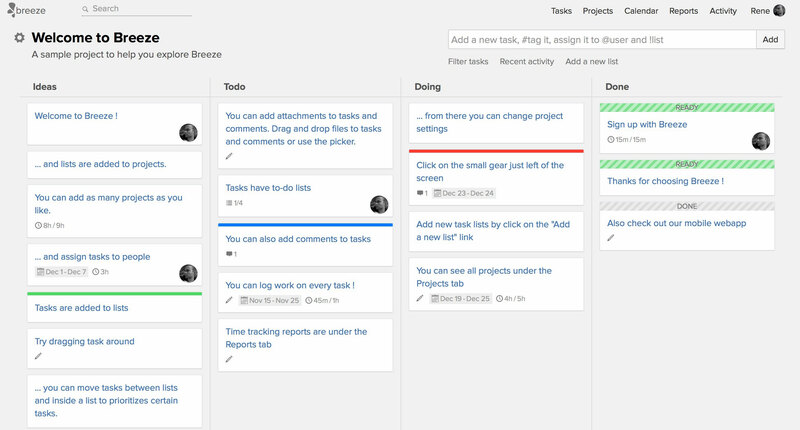 Use project boards or simple task lists. Share your projects with clients to get instant feedback. Discuss every detail of your marketing plan and keep everyone on the same page. Set due dates for tasks and manage content schedules. Track time on every task and set budgets. Use the built-in timer or integrations with Toggl and Harvest.